I have this crazy unrealistic goal in life I call 'making a hat Pete would wear'. Sometimes I think he's picky, but usually I think I'm just not getting this whole ManHat thing right, because he really does look awful in everything I'm able to get him to try. I've even bought him hats and they've been a total disaster. There are two exceptions, and they are a terrible red-orange acrylic toque he's had forever that is falling apart plus the crazy Jester hat I sewed him out of polar fleece one year when I had an assembly line and cranked those out for everybody on my list. I even sewed bells on all the points - they were ridiculous/cute. But also, worn. In fact Bob sent me a picture a few weeks ago of him out on a walk on Christmas Eve, wearing the one I'd sent him. I've made a possibly lucky mistake on this one: somehow, I added in 10 extra stitches to the body, and thanks to the joy of stocking stitch I had no reason to notice until I got to the decreases and the numbers didn't work. Opting to consider the larger size a gift, I didn't rip back but simply reduced the 10, then worked a row and continued with the crown more or less as written, whistling casually all the way in case anybody was looking. In considering what makes those other two hats successful, I've noticed that they don't follow the shape of one's head - one even has a fold-up brim that adds bulk around the forehead and adjusts the scale nicely. Maybe a hat that hugs too tight and makes your head look tiny only works when you've got longer hair that shows a bit, for balance. The other quality I've noticed about the fabric of those hats is that they're worked at a very fine gauge. 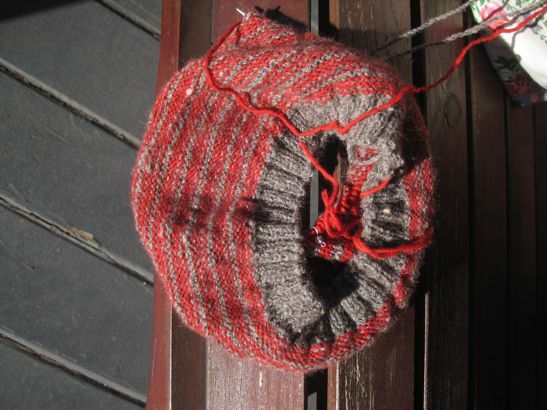 I wonder if I shouldn't try knitting a stocking cap from sock yarn, long enough to fold up at the brim? Or maybe it would be smarter to drag Pete out to a store and make him try on a ton of hats to see what works for sure before I knit anything else? 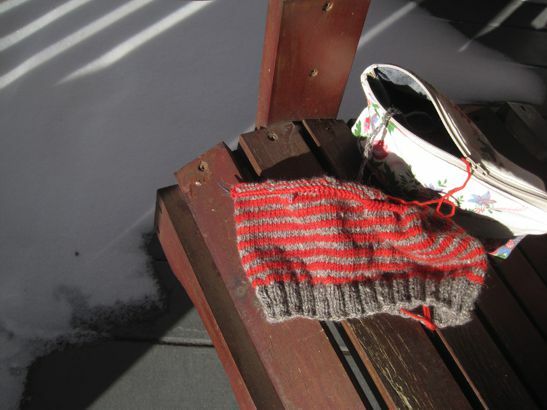 Or maybe just give up and knit more socks? I am knitting a Voyager cap for my hubby at the moment (see blog). What do you think? I think the Voyager hat looks fab!